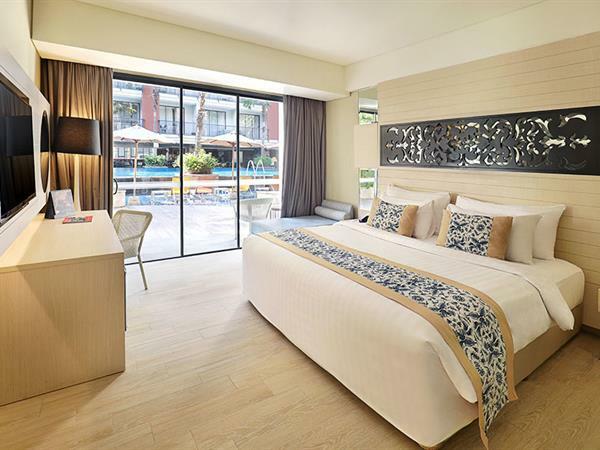 All room types feature modern amenities throughout providing a superior level of comfort and convenience complemented by typically Balinese design touches. Smoking or non smoking rooms are available and we offer specially appointed rooms for the disabled. Our modern Deluxe rooms measure 24.5 square meters and feature comfortable and flexible bed configurations of either twin or king size beds. Ideal for the family holiday, our Grand Deluxe Family rooms measure a generous 36 sqm and are thoughtfully designed for comfort and functionality. Flexible bed configurations are available with 1 King bed + sofa bed or 3 Single bed, accommodate up to 3 adults or 2 adults + 2 children under 11 y.o. Our spacious, beautifully appointed Grand Deluxe rooms measure a generous 32 square meters and offer flexible bed configurations of either twin or king size beds. Suite Room feature a spacious living room and dining table with pantry. The balcony with pool view make Suite Room a perfect option for luxurious holiday getaway. Suite Room measures 64 square meter and available with king size bed.